If you’ve ever uttered the phrase, “I’d rather have a root canal,” then you probably were not very excited about doing something. Therapies to treat an infection inside the root of teeth, root canals have long gotten a bad rap. While the infection that necessitates the procedure can be quite painful, root canal therapy can quickly alleviate the pain stemming from it. The caring dental practitioners at Associates in Dental Health are here to help you with whatever your dental needs might be. Associates in Dental Health for Root Canal Therapy? Patients who have an infection in the pulp or nerve center of their tooth may need root canal therapy to correct the problem. It’s important that patients understand the structure of their teeth in order to comprehend what a root canal infection entails. Teeth are made up of two main sections and three separate layers. The biting or visible surface of your teeth and the root are the two sections, and enamel, dentin, and pulp are the three layers. Tooth enamel is the strongest substance in our bodies, but it is still susceptible to decay when bacteria builds up on it. The dentin layer below can be considered the shock absorbing layer. This part of the tooth is not as hard as enamel, but it is still solid and provides the shape and structure for your teeth. 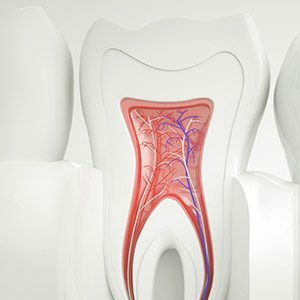 Finally, inside the dentin layer, our teeth are filled with pulp and nerves. 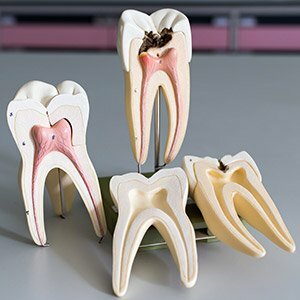 This is the material that makes it possible for teeth to grow. If decay reaches the soft, central parts of the tooth, it can cause severe pain because all of the tooth nerves are inside of this pulp. When decay reaches this inner layer, root canal therapy is necessary to repair and restore the tooth. If you have a root canal infection, our team will thoroughly examine and clean the area around the infected tooth. We will need to X-ray the tooth to outline the shape of the pulp layer and root canals. Once this is completed, all of the infected area will need to be removed. We’ll drill a small access hole in the tooth and use files to remove the infected tissue from within. For cases where patients have a very severe infection, they may be given an antibiotic to treat the affected areas before the dentist can complete treatment. Once the tooth is free of all decay and infection, your dentist will place a rubber like substance called gutta-percha into the tooth to replace the extracted pulp. 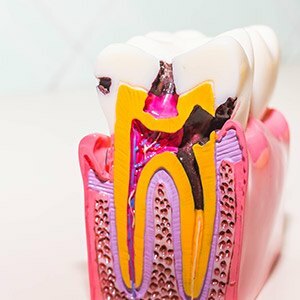 Depending on the extent of damage to the outside of the tooth, your dentist may only need to place a filling to close the access hole, or you may need a more extensive restoration like an inlay, onlay, or crown to fully repair your smile. After your root canal therapy, the pain should diminish significantly, though you may experience some tenderness while the tooth and gums are healing.